Hello! It's time for another Mojo Monday sketch (#280)! Today's fabulous sketch is brought to us by Julee. 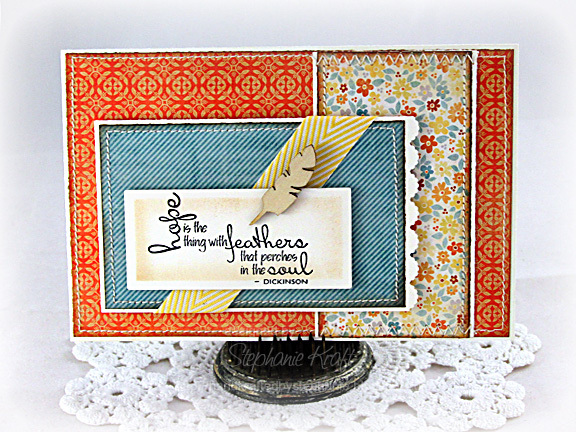 I loved how Julee paired feather embellishments with the Hope Perches Plain Jane on her assortment of cards HERE, so I set out to do something similar with one of my wood veneer feathers. I flipped the sketch and made mine into a 6x4 card for my Project Life album. Accessories: Scalloped Scallop border punch (EK Success), Twill ribbon (May Arts), Wood veneer feather (Studio Calico), Foam tape, Thread, Sewing machine. Love that quill! What a clever embellishment. Thanks for sharing. Your card is incredible. Love the feather with the sentiment! Great stitching. So pretty Stephanie! Love your choice of patterned papers and the fancy wood feather! Love the feather and the wonderful mix of papers. Lovely take on the sketch. Wow, that wood feather is just the perfect touch for this sentiment! Love your papers and stitching details!